Although the ultrasound technician ended up accidentally spoiling the baby's gender less than a week before baby E was due, an experience that involved tears (on her part) and consoling (on my part), the original plan was to have the gender be a surprise. 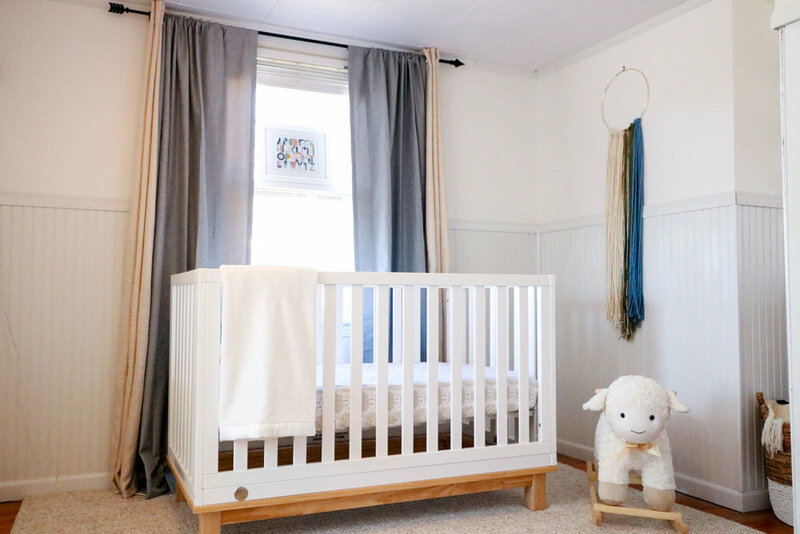 Luckily,I have all the heart eyes for gender neutral nurseries, and as an extra perk, I thought going gender neutral would help me reign in the design, keep it simple. A lot of white. I wanted the nursery to feel very serene. 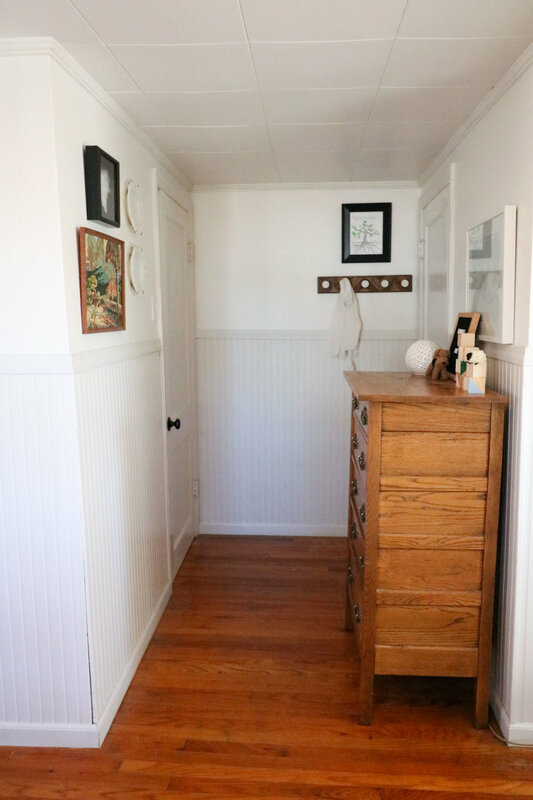 Plus, the room gets excellent natural light, keeping the white from looking too drab. A nod to boho. Oh, Pinterest and your bohemian nurseries. You get me every time. Lovingly picked details. I wanted to look around the room and see meaningful touches, not just pretty things. The room that would become the nursery on the day we moved in. 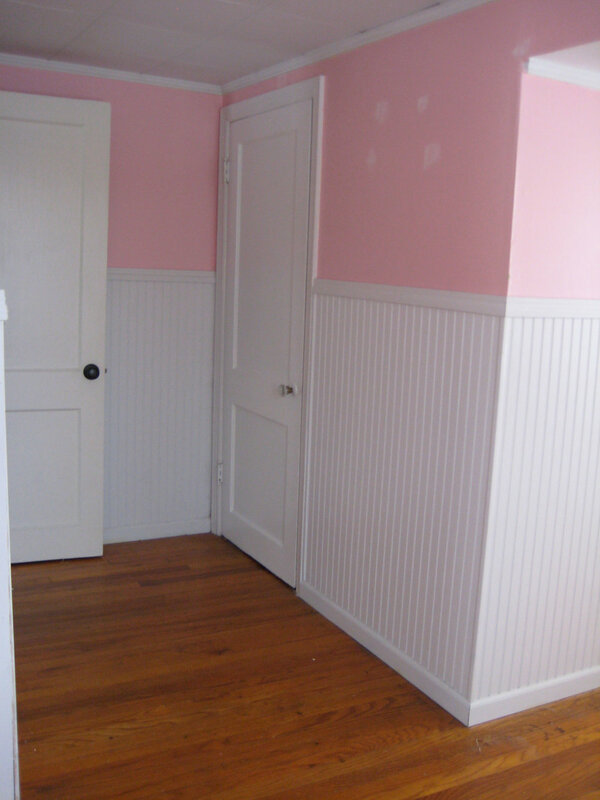 When my husband and I first bought the house, the walls of this room were a Pepto Bismol pink, which we painted Benjamin Moore Harbor gray straight away and used the room as an office mostly storage. The gray would technically have worked for a gender neutral nursery, but the heart wants what it wants. So, we painted the walls Bistro White by Valspar. It is a slightly warm white that we have used in multiple other spaces in our home. It provides a little contrast with white woodwork. Instantly, the room became brighter and felt more open. For accent colors in the room, I really liked forest green and ivory. My mom recommended light blue to go with the dark green, which is so dreamy. We chose this crib and love it so far. It has simple clean lines, and the wood base adds a little interest. Plus, it is reasonably priced. These are the crib sheets. Luckily, my parents saved the two dressers from my own nursery. The lower dresser is perfect changing table height, and the oak helps warm up the space. For the rug, I really wanted an oriental rug that pulled in the forest green. When I saw this rug, it was love at first sight. It even had some light blue! I confidently ordered it. When it arrived, I unrolled it in the space, and I immediately knew that it was not what I expected or wanted. The blue was turquoise and the green was more of a jungle variety. Having to get a different rug is NOT a big deal, but at the time, it felt big. So in a cloud of defeat, my husband and I trekked to World Market and their rug sale. We came home with a light blue rug, which ended up also being a no. I finally landed on this wool rug. It is soft and understated. It has lovely shades of ivory and oatmeal. It fits the space so well. Who needs color after all? Apparently not me. The glider was a tough call. Who knew they were so dang expensive? And, as The Rug Fiasco proved, pregnancy made my indecision go off the charts. We initially bought this glider. It was fine, but most importantly it wasn't hundreds and hundreds of dollars. My dad and husband lovingly hauled it home and got it into the room and assembled. And then I sat in it. And...it just wasn't right. So, my husband lovingly disassembled it and hauled it back to the store. Back to the drawing board. I considered this and this. But, in the end, I knew I had to actually sit in the glider before purchasing. Off to Buy Buy Baby. The glider we ended up with was the last one of a style they were no longer making. And...I love it. Because of the dormers, this room has lots of corners and crannies, one of which became a reading nook. I wanted book storage where the books faced outward, seeing the covers and not just the spines. Children's book illustrations are so beautiful and can act like art. These picture ledges did the trick. And, they hold SO MANY books. Perfect because I dream of afternoons reading with E.
Above the book shelves, I hung the lightbulb piece of art that I had bought on clearance at Hobby Lobby several years ago. My sister created the cross stitch of our dog Della and surprised me with it at my baby shower. The detail is amazing. She used this program and uploaded a picture of our dog. Every time at I look at Della's goofy dog smile, I smile. 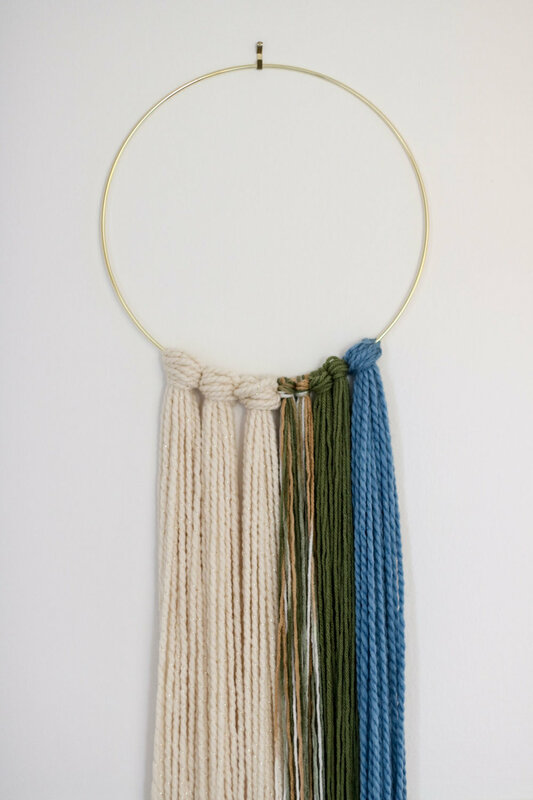 In the crib nook, my mom and I followed this tutorial to create a simple yarn wall hanging. A diy that comes together in 30 minutes is the best kind. Above the crib, my mom cross stitched an alphabet using this pattern (my family members are so generous). It took hours and hours, but it is so incredible in person. Having the alphabet (in some form) is such a traditional element in a nursery, but this cross stitch is very modern looking. I developed a thing for sheep during the nursery design, as evidenced by the crib sheet and rocker (found at Home Goods). The changing basket, which is made in Uganda, brings texture and natural materials to the space. 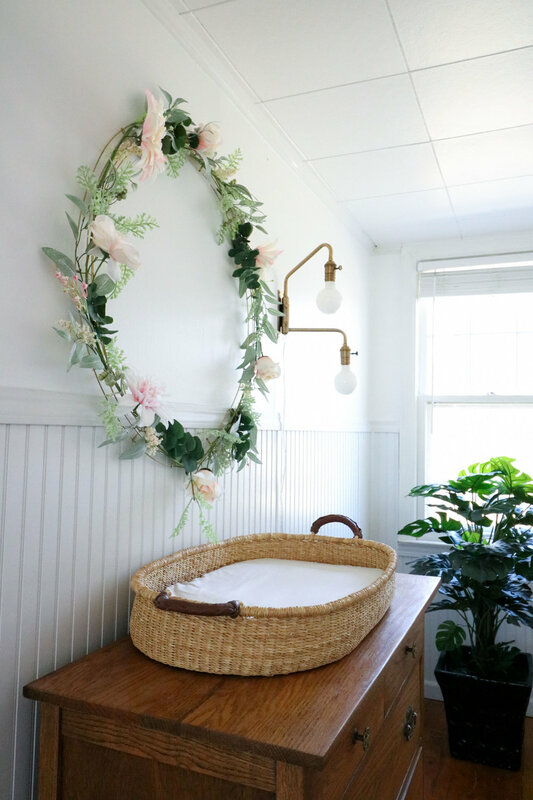 My mom and I made the large floral wreath above the changing table. We bought an enormous wire wreath form, spray painted it gold, and wound a garland of faux flowers to the wreath form using gold floral wire. We also bought some random sprays of faux flowers to tie into the wreath and help fill in emptier spaces. I don't mind there being a touch of floral in a boy's nursery. The wall sconce is striking in person and provides a good amount of light. Above the tall dresser, there is an array of fun stuff. I printed and framed this digital print. I'm all aboard the letterboard train, and I use it for E's monthly pictures. Luckily, they have become so much more reasonably priced. I painted the wood blocks with the nursery accent colors. The crocheted Airedale terrier was a gift from my sister-in-law and is an adorable way to pay tribute to our family pup. 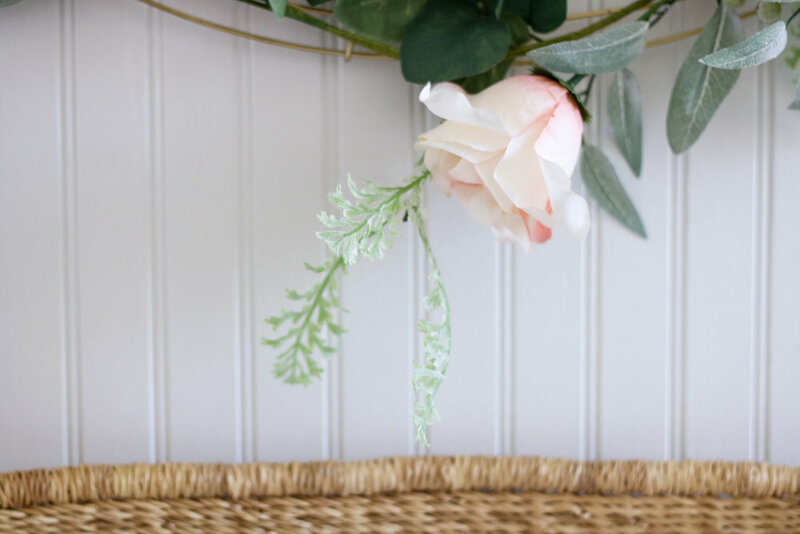 The precious pom sheep were created as decor for a baby shower thrown by mom following this tutorial. The nightlight works as a functional piece of decor. Opposite the tall dresser, I hung a paint-by-numbers landscape that my great-grandmother, who I never had a chance to meet, painted. My mom framed a pair of angel wings to honor our babies in heaven. On the wall behind the door, I knew I wanted a coat rack to hang jackets and bags. The artwork above the coat rack was created at a sweet baby shower my friend threw. It is a nod to the guestbook at our wedding. The guest stamped their thumbprints onto the tree, creating leaves. Then they wrote one thing they hoped E would grow in throughout his life. 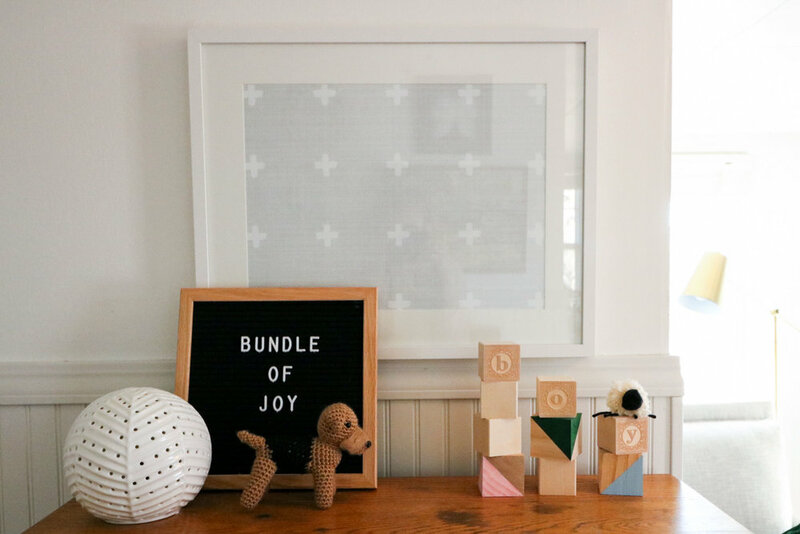 The nursery ended up being a cheerful, peaceful place, and when I look at the walls, I see so many personal reminders that bring gratitude and joy.